For 200 years, the Gulf of Mexico kept the secret of the Mardi Gras shipwreck. It guarded the ship’s carcass in darkness beneath 4,000 feet of sea water, well out of reach of curious human eyes and probing hands. Until now. 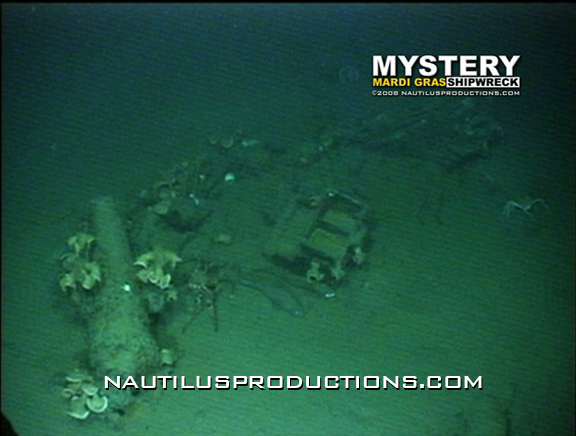 Through a historic archaeological expedition and recovery effort involving dozens of scientists, the latest in deep-sea recovery equipment and the work of a remarkable filmmaker, the clues of the Mardi Gras, the working name of this mystery ship, are finally being revealed to the world. Scientists and archaeologists from Texas A&M University and the U.S. Minerals Management Service (now BOEM) in New Orleans established a list of questions to be answered by the Mardi Gras expedition: What is the real identity of the ship? What flag did she fly? Who were her crew members? Was she a pirate vessel or a merchant ship? And what were the circumstances of her demise in the deep waters of the Gulf of Mexico, 40 miles off the coast of modern-day Louisiana? 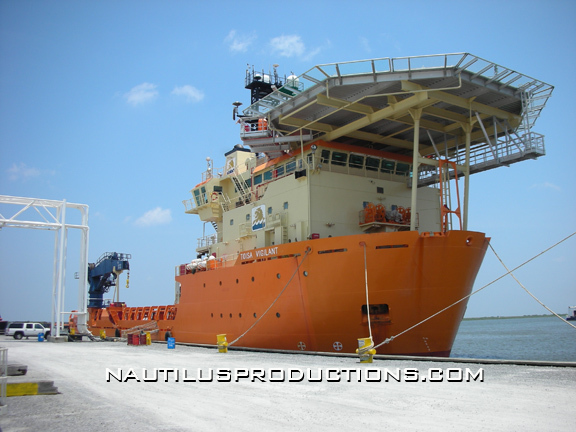 In May 2007, freelance producer and director Rick Allen of Nautilus Productions along with two of his crew members, boarded the Toisa Vigilant, a research vessel docked at Port Fourchon, La. 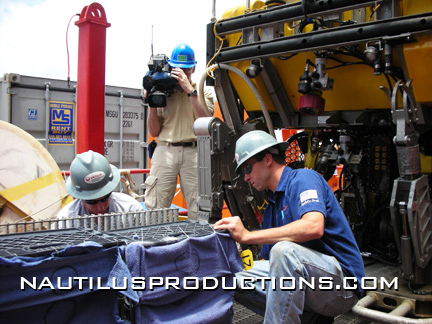 Nautilus Productions’ videographer Lawrence Taylor documents ROV technicians preparing artifact baskets for their journey to the ocean bottom 4000′ below during production of the documentary, the Mystery Mardi Gras Shipwreck. 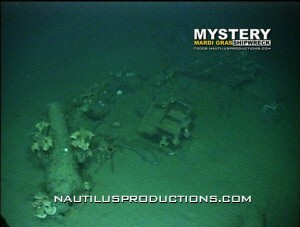 For three weeks, Allen and his team, marine biologist Lawrence Taylor, a Canadian filmmaker, and nautical archaeologist Kim Faulk, would live in close shipboard quarters as part of a 60-member expeditionary contingent whose mission it was to bring the stories of the Mardi Gras wreck back to the surface. Their task would be to capture in high definition video all of the deep-sea excavation work taking place thousands of feet below by remotely operated vehicles, or ROVs, and to document as much of the action on deck as possible. The job required months of intense planning and preparation to ensure the Nautilus crew carried with them onto the research vessel every piece of equipment and gear—and back-ups—that they would need for the trip. Obtaining replacement parts at sea would be all but impossible. Since 1997, Allen has worked as the project videographer on the wreck of the infamous pirate Blackbeard, the Queen Anne’s Revenge. That wreck lies just off the coast of Beaufort, N.C. Allen has also been diving and filming on the USS Monitor, a Civil War ironclad that sank off the North Carolina coast near Cape Hatteras in 1862. The Mardi Gras Shipwreck Project is his latest nautical adventure. 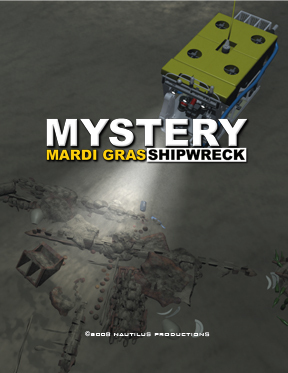 The Mardi Gras wreck was discovered in 2002 by an oilfield inspection crew using ROVs with video cameras to survey the sea floor for a new deep natural gas pipeline, the Mardi Gras Gas Transmission System. Texas A&M University in College Station, Texas, was chosen to complete the recovery and artifact conservation after funding was arranged between Okeanos Gas Gathering Co. and the U.S. Minerals Management Service. Rick Allen and Nautilus Productions were selected to create an HD documentary to bring the Mardi Gras story to a broader audience. To do the job right and ensure that he could tell the story in a compelling way, Allen chose his equipment carefully. The challenge in the field, he knew, would be recording the work of scientists in multiple spots onboard the Toisa Vigilant while continually recording the underwater work being conducted by the ROVs. He knew also that he needed equipment that could stand up to harsh conditions, particularly the heat and high humidity of the Gulf of Mexico in late spring. Allen purchased a new Sony F330 XDCAM HD camera specifically for this project. The F330 served as the main camera, capturing the details of the work onboard the ship in exceptionally high quality without the worry of fogging and condensation as he moved between air-conditioned ship cabins and the humid air outside. A Sony HVR-Z1U HDV served as the B camera. 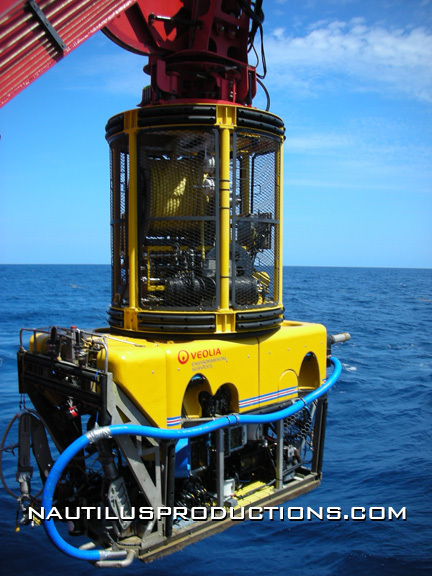 The pressure at 4,000 feet below the surface of the sea is enormous, enough to crush a human body, so archaeological recovery work at that depth required the use of ROVs and specialized equipment tailored to the project. On the Toisa Vigilant, the underwater work was completed by a Triton XLS-17 ROV connected to Sony DSR20 and DSR11 DVCAM decks used by Allen and his crew to capture over 240 hours of underwater footage. Peter Hitchcock is a doctoral candidate in the Department of Oceanography in the College of Geosciences at Texas A&M. Hitchcock, who holds a master’s degree in nautical archaeology, served as the Mardi Gras project manager for the university. For Hitchcock, the most exciting moment of the expedition came on its eighth day, when the large artifact basket was pulled from the water. Before the recovery of artifacts could begin, the scientific crews first had to photograph and map the wreck site, so that later, in the laboratory of the Center for Maritime Archaeology and Conservation at Texas A&M, they would know where each artifact had been found in the wreckage. Then the crew had to ensure the delicate artifacts made it through the water column and onto the ship’s deck intact. It made for some tense moments. “Everything came up perfectly, and when we first opened up the doors to the main basket and looked in and saw all the artifacts, it was pretty cool,” Hitchcock said. The scientific crew recovered at least 600 artifacts, including a 6-foot cannon, a cooking stove, lots of wine and rum bottles, some large stoneware jugs and plates and a captain’s spyglass. They discovered a number of hourglasses, too, which were an interesting find. Their wooden frames were long gone, but the glass forms remained intact and the sand inside of them dry. The crew tried but was ultimately unable to bring up a box of swords and muskets. For the near future, conservationists at Texas A&M will continue to clean and preserve each artifact. Once complete, the treasures will be delivered to the Division of Archaeology of the Louisiana Department of Culture, Recreation and Tourism. They will be displayed at the Louisiana State Museum in New Orleans. Jack Irion, the supervisor of the social sciences unit of the U.S. Minerals Management Service (now BOEM) in New Orleans, which has overseen the project for the U.S. Department of the Interior, has worked in marine archaeology his entire career. He said most artifacts pulled from the Mardi Gras wreck have been dated to the period around 1810. Going into the project, Allen knew he wanted to deliver in HD to a major cable television network. He also plans to deliver an Internet version of the project. “I had a limited budget,” Allen said, “so I had to work hard to find HD solutions to stay within my budget but find an HD format that would suit the networks. “ Apple and Sony XDCAM HD is helping him accomplish his goals. So he can tell the story of a 200-year-old mystery ship that is again making history. Learn more about our other projects – Blackbeard’s Queen Anne’s Revenge Shipwreck Project & the SS Commodore.